American cuisine with a touch of Mediterranean influence. : Leave it to DC chef Robert Wiedmaier to come up with a catchy little restaurant in the middle of a busy shopping strip. 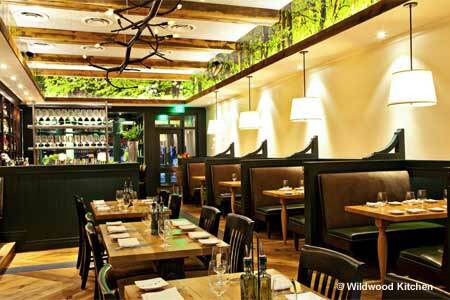 Wildwood Kitchen is decidedly elegant with dark woods, polished wooden floors, and an extensive up-front bar. The menu bears certain Mediterranean overtones: lamb meatballs are accented by harissa; grilled octopus merits some piperade; beet salad is garnished with Greek yogurt. But the balance of the dishes have creative American interjections, as in a farmers salad with quinoa brittle or red wine-braised beef with orecchiette and pearl onions. Pastry chef Chris Kujala invents sweet treats, so ask what’s new for the day. Also investigate the cocktail, wine and beer selections to complement your meal.